A Picture History of Kew Gardens, NY - Class Pictures - PS99 Grade 6-1 1961. 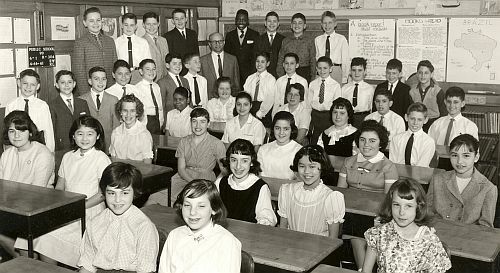 The student on the far right in the back row is Stan Ulasinski who Kew Gardens residents know as Stan at Pac Video on Lefferts Boulevard and Beverly Road. The second boy on Mr. Ellenport's (lower) right is David Green. The third boy on Mr. Ellenport's lower left is Fred Rappaport. The fourth boy on Ellenport's lower left is Ronald Kloot.